Step One: Simmer chopped carrot, onion, celery, sliced mushrooms in two quarts of reduced sodium chicken broth (8 cups) with your seasonings (salt-free chicken bouillon granules, dried parsley and thyme, garlic powder) for 30 minutes. 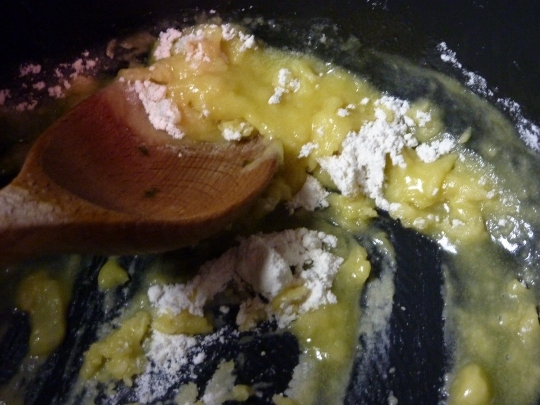 Step three: Slowly incorporate broth and veggies into butter/flour (roux) mixture. Bring to a boil for a couple minutes, while stirring, to thicken. 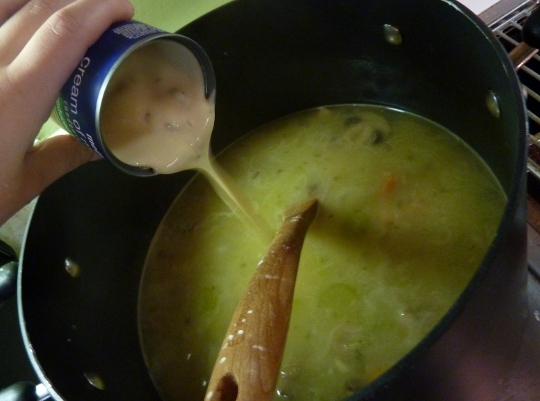 Stir in one can condensed cream of mushroom soup. Step 4: Stir cooked wild rice into soup. I cooked this yesterday, as it takes 60 minutes on the stove, and had it ready and waiting, in tupperware in the fridge, for tonight. 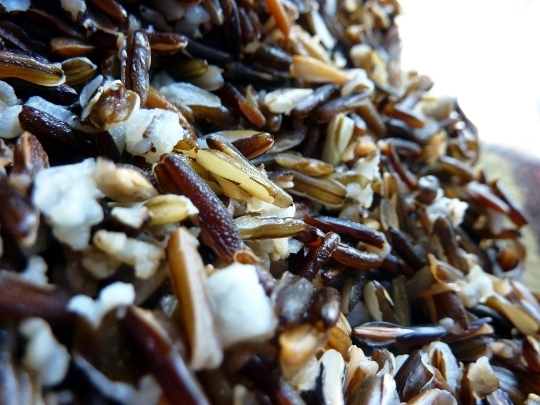 Wild rice is one of my favorite foods! I adore the nutty, chewy texture, and earthy flavor, which complemented the mushrooms in this soup especially well. 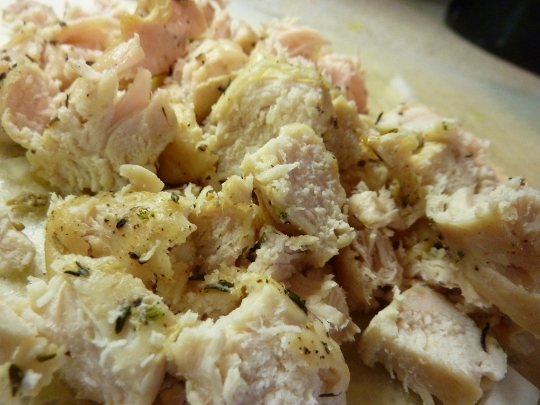 Step 5: I also added in chopped, cooked chicken breast, seasoned with thyme, salt, and pepper, which baked while my veggies were simmering away for 30 minutes. 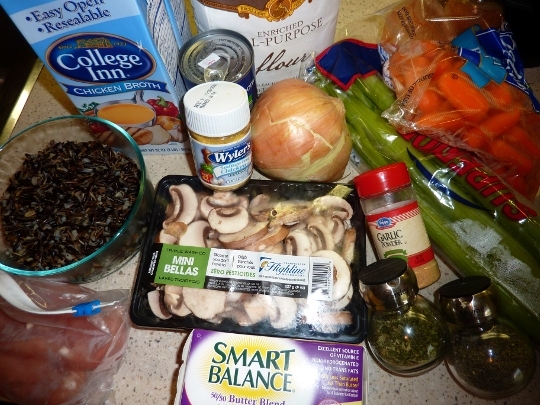 Chicken Wild Rice Soup! The recipe makes a HUGE batch (around 14 cups! ), but each 1 cup serving has only 154 calories. You could cut the recipe in half, but I say make the whole thing – soup leftovers are amazing to come home to, and you know soup only gets better after the first day! Yum-o! Before serving my first bowl, I wish I had realized that most of the rice had settled to the bottom of the soup pan. For my second bowl, I made sure to give the soup a good STIR before ladeling it out, to make sure I got lots of rice in my bowl. That’s the best part, I think! 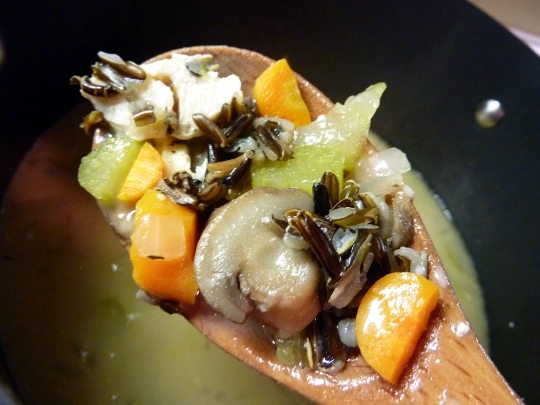 If you enjoy rich, earthy mushroom flavors and chewy, nutty wild rice, you will love this soup. 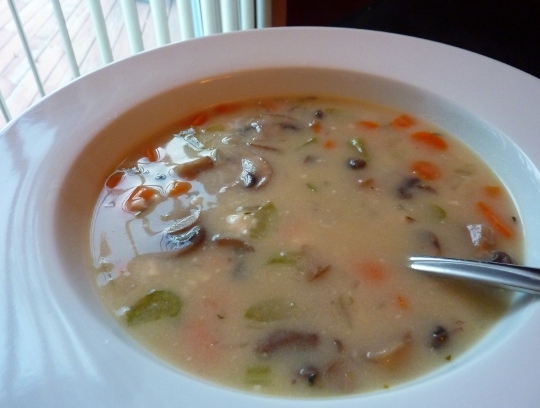 It does have a strong mushroom flavor, so if you are not a mushroom fan, you could always omit the mushrooms and use potatoes instead, and substitute cream of chicken or cream of celery soup for the cream of mushroom soup. I personally love these flavors, so I highly enjoyed this soup. I look forward to the leftovers! ♪♫ Currently listening to: The End – The Doors. It looks delicious and nothing better than leftovers. MOM I love wild rice too!!! !